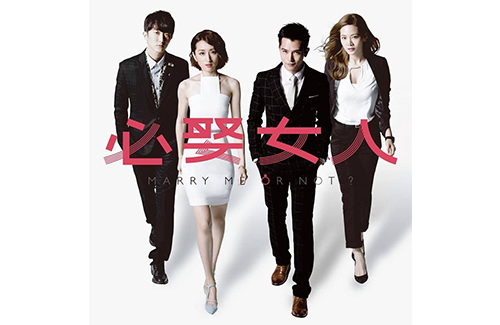 Taiwanese idol drama Marry Me, or Not? <必娶女人> is currently airing on CTV. The drama stars Alice Ko (柯佳嬿) as Vivienne and Joanne Tseng (曾之喬) as Sheng-nan, two “frenemies” who have been competing against each other since college. When their ex-boyfriend Qian-yue (Harry 懷秋) returns to their lives years later, the two women ignite a new breed of cutthroat competition. Harry, who portrays Jiang Qian-yue, made his first appearance in this week’s episode. Although Marry Me, or Not? is not his first television drama, the Da Mouth vocalist had a very stressful experience while shooting the idol series. “I kept having nightmares,” said Harry. “I once dreamed that I couldn’t speak my dialogue clearly and ended up getting scolded by the director.” Harry broke out in a cold sweat and couldn’t go back to sleep after his nightmare. Alice plays the girlfriend of Roy Chiu (邱澤), who portrays the divorce lawyer Justin. The onscreen couple have many kissing scenes throughout the drama, resulting in many awkward and hilarious scenarios. Alice said she once got Roy sick, because they were shooting a kissing scene while she was struggling with a cold. Because she got so used to kissing Roy, she would automatically lean in and close her eyes whenever their lips touch, causing many outtakes. The actress recalled a scene where Roy kissed her while they were riding a carousel, but instead of acting shocked like what was written in the script, Alice ended up closing her eyes. The director stopped the scene, telling her that she was getting too into the kiss too soon. “Vivienne [her character] has no restraint at all,” she joked. It is just an indication that this pair have collaborated one too many times. So this is their 100th drama together? LOL! @aiya I believe this is only the 2nd collaboration between both of them. I love their chemistry in “Office Girls” and “Marry Me, or Not”. I’m anxiously waiting for a new episode each week. Tomorrow we will get to see ep. #6.